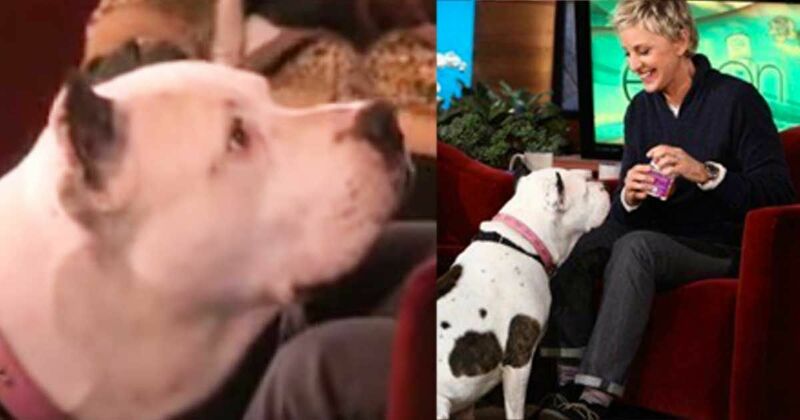 Get ready to put a smile on your face as pit bull, Snorky charms the audience on The Ellen Show. The interview focuses on the hit show on Animal Planet, Pit Bulls and Paroles where the founder, Tia Torres uses misunderstanding to ultimately teach love and compassion. However, the conversation is quickly taken over by Snorky’s playful personality and uninterrupted focus on treats. Torres explains that Snorky has been at the rescue since 2003. He was found wandering the streets of Hollywood during a rainstorm. However, when good Samaritans stopped to check on him, he immediately jumped into their vehicle ready to make friends! However, they were unable to keep the playful pooch and has since been living at the rescue waiting for his forever home. While the conversation about his unfortunate past was heartbreaking, Snorky definitely lightened the mood. Viewers get a kick out of dog as he looks directly at Ellen, who continuously feeds him snacks. He doesn’t dare break his gaze as he waits patiently for a treat. Ellen and Torres joke that Snorky should probably be a spokesperson for that particular snack. The pooch could care less about the audience or the conversation; he just wants his food! Snorky is just one of hundreds of pit bulls that Tia Torres has worked with over the past several years. According to Animal Planet, it was her own experience with being misunderstood that inspired her to help people and animals that are judged by society. Specifically, Torres hires ex-convicts to work with, train, and ultimately love rescued pit bulls. She says this about her journey, “The guys I hire are ones whom no one else wants. I always have wanted to put my 'badness' to good use, so I combined my lifestyle with my love for animals by giving parolees the chance to make a real difference." However, just as much as she wants to help these men get a second chance, she is just as determined to reshape how society sees this loving breed. Snorky is available for adoption, and while he isn’t good with other animals, he loves children. Potential adopters should be prepared to load up on the treats! Watch the video below to see the cuteness for yourself. Watch as this adorable Pit Bull Gemma patiently lets her little friend learn how to bathe her.